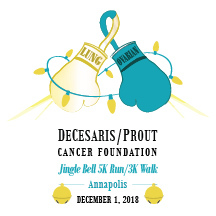 Join the DeCesaris/Prout Cancer Foundation in Annapolis, Maryland on Saturday, December 1 for the Jingle Bell 5K Run/3K Walk. This great event will help get the holiday off and running! This event is designed to raise awareness for lung and ovarian cancer. This Run/Walk is geared towards the general public as an incentive to participate in a healthy lifestyle while offering an opportunity to educate them about early detection of lung and ovarian cancer. In addition, the event is also designed to raise funding to support various educational research programs. On-line registration will close on Thursday, November 28 at 8:00 pm. Late registgrations will be accepted during packet pick up and on race morning. Long sleeve commemorative race shirt will be given to paying 5K and 3K participants. Be sure to register before November 15 to be guaranteed a shirt! There will be a special award given to the best costume, show us your holiday spirit! Thank you in advance for generously donating to the DeCesaris Prout Cancer Foundation. Helping to bring awareness to Lung and Ovarian Cancer.